Is the IT Era Over? Don't Bet on It! There is no doubt that the introduction of new technologies in the workplace has had a very strong positive influence on labor productivity in the United States over the past 40 years. The chart below is pulled from data collected in a recent paper created entitled “Is the Information Technology Revolution Over?” by David M. Byrne, Stephen D. Oliner and Daniel E. Sichel and recently posted at the Centre for the Study of Living Standards here (http://www.csls.ca/ipm/ipm25.asp). US labor productivity was clearly in growth mode during the period between 1995-2004. But what drove this productivity increase? The analysis is interesting, as it reveals the drop off in all three types of technology over the past 8 years – hardware, software and communication equipment. Also worth noting is that contribution of communications equipment has remained the most stable driver of productivity over the past 40 years. However, with all categories of technology driving less productivity increase over time – the article’s poignant question remains: Is the Information Technology Revolution Over? In a follow up commentary on the original paper, Chad Syverson of the University of Chicago provides some interesting insight. Comparing the IT Era to the original productivity growth sparked after the introduction of electricity, Chad provides an interesting look at the future potential growth in productivity that may yet come from the integration of IT. To this point, a recent article in the Economist examined the research above, and found it took an average of 5 to 15 years for new advances in information technology to take root and have an impact to the overall economy. 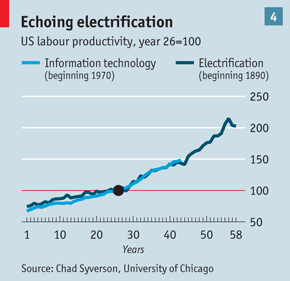 This suggests that the slowdown in productivity increases in the 2004 time frame is more the result of technology developed during the pre-mobile and social era, rather than new technologies being implemented today. This shouldn’t come as too much of a surprise to those of us in the collaboration industry today. As we work at the intersection of Mobile and Video Collaboration, Social Media, Big Data and Cloud we know there is a fair bit of work to be done to provide holistic solutions that allow businesses to succeed. The good news is that there are productivity gains to be found, once new solutions that combine these trans-formative technologies come to the forefront and as workers come to adopt these new technologies into their day to day work cadences. Together, these outcomes will transform technology into true collaboration and innovation in the workplace.